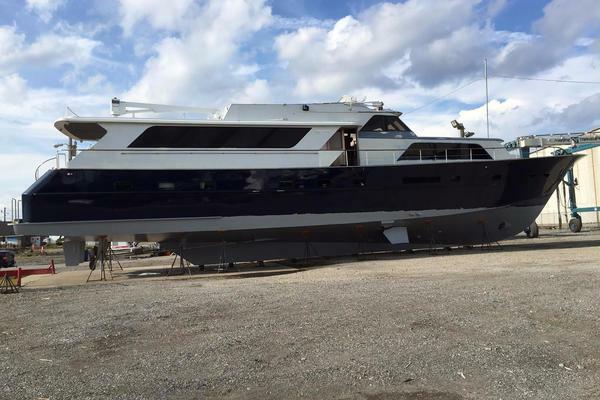 United Yacht Sales New Jersey would love to guide you through a personal showing of this 98' Mcp Tri-deck 2007. 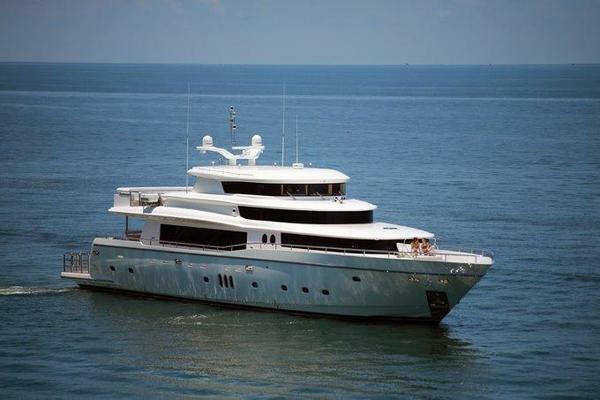 This yacht for sale is located in Miami, Florida and priced at $3,247,000. For a showing please contact us by filling out the form on this page and we will get back to you shortly! At the core of the Brazilian influence on BERADA'S GFT-98 design is a floor plan that is wide open, family oriented and, most importantly, fun. All of the living spaces, as well as the stairwells and companionways, are wide and spacious giving the impression that you are on a much larger yacht. The owners chose a mix of light colored fabrics, brightly colored accents and satin finished Maple wood to invite their guests to interact in a casual, festive and relaxed atmosphere. Crossing the expansive teak laid aft deck, there are large, glass doors that can slide all the way outboard so the aft deck and salon seamlessly come together. The salon, dining room and galley compose the interior main deck with a layout that is perfect for family or formal entertaining. Largely because of the uninterrupted transition from the aft deck, the entire main deck is voluminous and spacious and lends itself equally well to a large crowd as it does to a quiet gathering. With a central galley in lieu of a country kitchen, the GFT has a spacious on deck master with en suite bathroom (showers only). As a family yacht, there are two queen staterooms and one multi-berth stateroom below deck that are centered about a large foyer, providing quarters for eight additional guests.. All staterooms have a settee and large en suite bathroom. With almost seven feet of free headroom and oversized port-lights, below decks have a bright and spacious feel which is similar to the main deck. Throughout BERADA, the high quality finish, detailed inlay and custom carpentry are all hallmarks of the noteworthy evolution of MCP Shipyard's interior craftsmanship. The elegant finish-work without a doubt, meets the high expectations of the luxury yacht market. This same detailed craftsmanship and open layout philosophy is carried through to the upper decks which are accessed from the aft deck or salon by wide, teak stairwells. For safety and ease of use, the 98 GFT has a separate pilothouse on the skylounge deck with all of the latest equipment for navigation and monitoring. When in need of a better vantage point for dockage or navigating shallow anchorages in the Bahamas, the captain also has an aft deck control station and a third helm station on the flybridge. Naturally, he will have plenty of company on the flybridge sundeck because the owners have incorporated seating and sun pads to take advantage of the panoramic view. A custom, aluminum framed bimini that is fully retractable adds yet another element of alfresco versatility to the flybridge of the GFT. Aft of the pilothouse, the skylounge deck incorporates another large social gathering area including the interior sky lounge and the outdoor Jacuzzi area. The interior sky lounge consists of a round table with seating for six to enjoy breakfast or a card game, some gym equipment, and a convenient day head. The aft sundeck and Jacuzzi are available for relaxing with a spectacular view. The tender sits behind the Jacuzzi and can be launched at a moment's notice to create even more space. Forward to the Jacuzzi is a large wetbar/BBQ area for service and refreshment needs. At this level, guests have safe and convenient walk-around decks that lead to the Portuguese walkway and the bow area. If you approach BERADA on a floating dock, you will almost certainly be impressed by the high, expedition style bow which resembles that of a much larger yacht. With over 13 feet of vertical distance from the waterline, the high bow sheer makes the vessel safer and more comfortable when heading into rough seas far offshore. To accommodate the "go anywhere" mantra of the GFT, the bow is outfitted with two large 110kg Rocna anchors with 300 feet of 5/8" inch chain and matching 3 phase Maxwell 4500 windlasses. And, in case you are thinking that the bow was given entirely to functional design, the periphery of this working foredeck offers comfortable, secluded seating. At the stern end of the yacht, BERADA has a large cockpit for fishing and other water activities. The plumb transom brilliantly hinges open on hydraulic rams to create a large swim platform and extend the boat to a full 98 feet, hence the title GFT 98. Incorporated into the port side of the cockpit, there is a unique and functional hydraulic passarelle for aft, med-style, boarding. The cockpit, too, has teak decks and a high gloss varnished cap-rail. In addition to all of the superior design and layout details, the engineering of the boat is its real strength. Coordinated use of space provides BERADA with sufficient engine room and lazarette space to accommodate all of the necessary equipment for operating independently over long periods of time in any part of the world. The standard design and specifications includes Northern Light 32KW generators, an ASEA shore converter, Alfa Laval fuel centrifuge, 4 watertight bulkheads, double bottom hulls, fresh water flush of main engines and generators, 1480 GPD water-maker, Freeman watertight doors and hatches, CO2 fire suppression, computerized central monitoring system, 12 square foot Naiad Stabilizers, Headhunter sewage treatment, bow thruster and stern thruster. For the adventurous crew and owner, the propellers are protected in tunnels behind a structurally reinforced keel. All of these elements come together inside a Lloyd's approved and classed hull (Special Service Craft) that is efficient enough for the Caterpillar C32 main engines to easily achieve an 18 knot cruise or efficiently take you 2500 nautical miles at 10 knots.